LAURA LOUISE HAYNES: N E W I N | White Chunky Cleated Open Toe Mules. N E W I N | White Chunky Cleated Open Toe Mules. I went out one time and realised how bad I needed white heels in my life therefore I made it my task to get some I loved. Well it was pretty damn hard finding any. 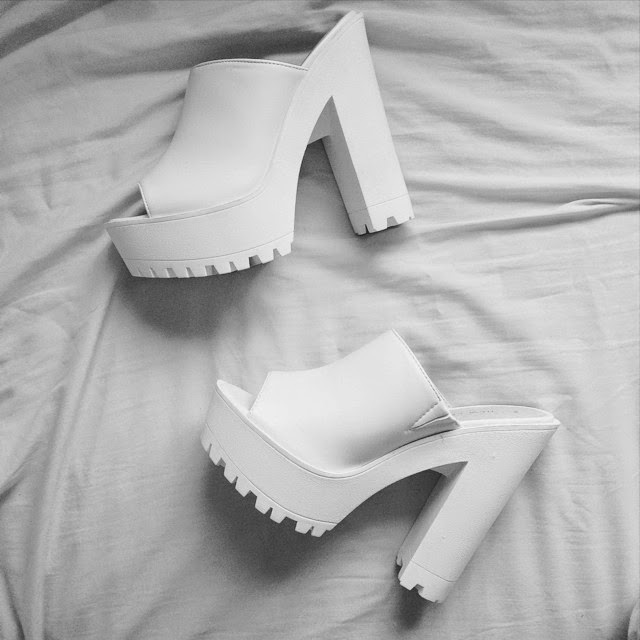 White chunky shoes in a small size = sold out everywhere. It wasn't until I was browsing New Look on a whim that I came across some that suited my style. Chunky, cleated and white - but v difficult to walk in. I always get shoes from New Look lately. Good prices and they sell a good range of chunkyness in shoes. I can imagine these are hard to walk in, at least they have a massive platform, so makes it a bit easier! Love them! I adore cleated shoes, especially these all white mule ones they are divine. I can only picture how hard they would be to walk in...lots of practicing in the house first ;)!